Some ryokans strive to preserve traditions while also introducing new changes. For instance, the latest relaxation facilities and services can be found at ryokans which are sensitive to the needs of their guests. 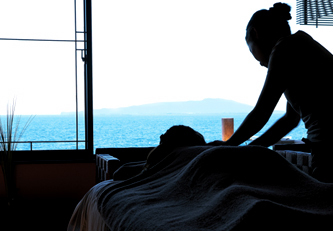 Treat yourself to exquisite relaxation away from the stresses of daily life. Massage has traditionally been available at ryokans, with a massager visiting your guestroom. In recent years, however, an increasing number of ryokans have introduced various new facilities and services with greater therapeutic benefits. Some ryokans have opened beauty salons, with full-time beauticians. Quite a few ryokans also welcome male guests for esthetic treatment. Popular among female guests - aromatherapy The latest trend among ryokans across the country is to offer spa relaxation that combines a hot spring bath with air bubble bath facilities.